A motorcycle forum known as Pashnit was having a ride to Jalama beach and among the members on that ride is Ken, my Ride to Colorado partner. 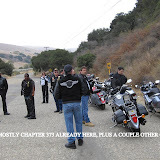 However, I did not want to do the ride from Chuy's in Santa Clarita to Jalama so decided just to ride direct to Jalama and wait for the arriving riders. Along for the trip with me is Luis and Minita on their V-Star 1300. Since the Pashnit meeting was the primary reason to go I did not see having a bunch of people ride up and wait for some folks they do not know. we stopped on the Pacific Coast for a break before hitting Oxnard and we went on further to Carpinteria for fuel before continuing to Jalama. and surprised to find one member already there. His name is Skip or "NanSkip" on the forum and it was great to meet at least one member that I had never met. The three of us get a hamburger and have lunch there in the Jalama Beach store. The place is somewhat famous for their hamburgers and we had a very scenic lunch room to enjoy our culinary delight. I have no idea if they serve any other sandwich items. we head back to the parking lot as time is flying by and it's now 1:45 pm and getting very close to being late to leave for home. What do we see, but no Pashnit members at all. Nanskip and his friend had left, so we prepare to go as well. We head up the exit road and here comes a group of riders probably from Pashnit. We turn around as I hope to get a chance to at least say hello to these new arrivals. As the time was now past 2 pm we take off again heading to Buellton and Solvang to return to Santa Barbara and the 101 Freeway. We had to stop for pictures at a Vista Point but take off for Southern California at a much later time than planned. All the pictures including some from last years STAR trip to Jalama. On-the-road photos courtesy Minita V.
Leaving the Vista Point and then hitting the 101 Freeway it's a straight shot back to the vast swamp of the 101-405 freeway interchange then south on the 405. Before we get there we were at about 108 miles since fuel in Buellton so I pull off the freeway and into a little community and no gas station. After a goofy U-turn and back on the freeway we take the next big exit and hit lots of traffic. From this point on the freeway it's solid cars and getting DARK. As we head south on the 405 it is now really dark and we navigate our way through traffic. Luis, being a bit smarter than me gets in the diamond lane and off he goes, I follow but it takes me a couple miles to get into the diamond lane. At some point we are finally going over 65 mph and it's interesting to say the least. 70 mph in the dark on the 405 Fwy in the Diamond lane will help focus your attention no matter how short your attention span is. I finally arrive home at 7:10 pm and glad to arrive safely. We did about 390 miles for the day. nice efforts,nice pictures,You've got a great blog there keep it up. I'll be watching out for most posts. Where to put the STEBEL ('LOUD') HORN.